Along with things like regular haircuts and lengthy hot showers, while on our trip I missed my KitchenAid mixer. Is it possible to make scrumptious things without one? 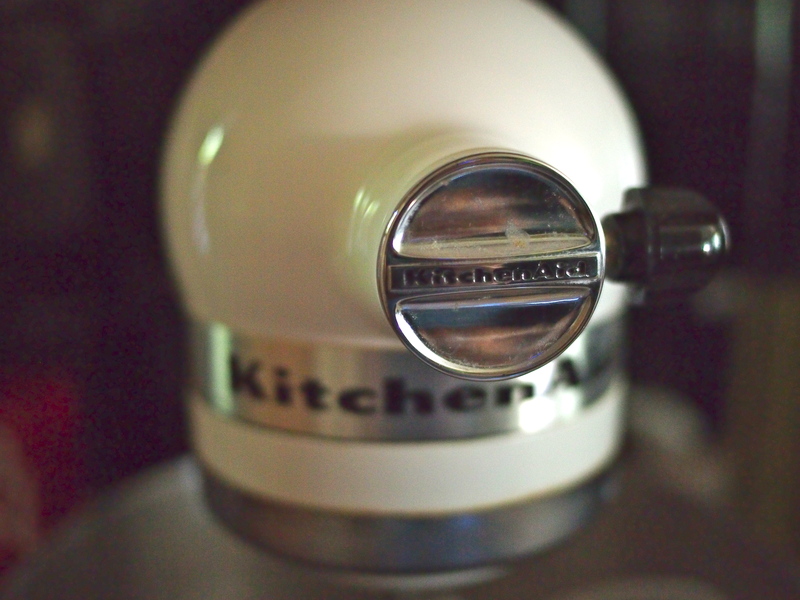 Of course, but for banging out sticky doughs, the KitchenAid is tops. I named my trusty mixer Janet. I know, I know, it’s ridiculous to name your appliances. It started as a joke and just stuck. In any case, before our trip she got a pretty regular workout with butter and flour. Janet is still in storage, so I was fortunate to put my mom’s mixer to good use when I visited. 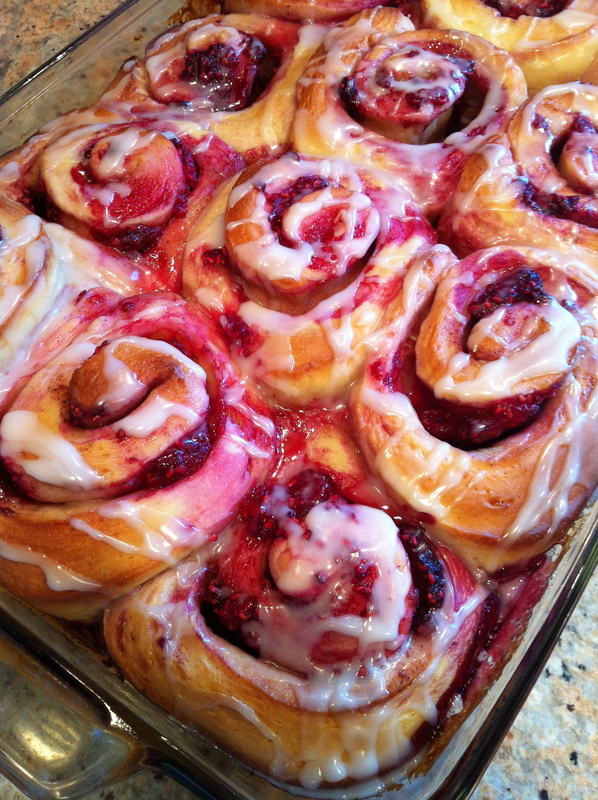 These luscious, sticky rolls elicited a lot of ooohs and ahhhs and yums on Father’s Day. The dough is slightly sweet, balanced with a tangy raspberry filling. For an extra festive kick, I topped them with a glaze made with limoncello. I found this through the excellent Joy the Baker, who posts seasonal recipes and cooking tips paired with beautifully styled photos. Her blog always makes me hungry. Don’t let the length of the recipe discourage you; these actually came together quite easily. Let your mixer – whatever it’s called – do the hard kneading work. In a small saucepan over low heat, warm the milk to about 95 degrees. Pour the warm milk into the bow of an electric stand mixer fit with a paddle attachment. Stir the sugar and yeast into the warm milk and let sit for 5 to 7 minutes. The yeast will foam and bubble. That’s how you know it’s alive. After frothy, add the butter, eggs, lemon zest, and sea salt to the yeast mixture. Whisk together flour and spices. Add to liquids. Beat on low speed with the paddle attachment for 2 minutes. Stop the mixer, scrape down the sides of the bowl, and replace the paddle with a dough hook. Beat dough with the dough hook on medium speed for about 10 minutes. Dust a clean counter with flour. Scrape the dough out onto the work surface. Sprinkle with 1/2 cup of flour and knead for about 2 minutes. Dough will be soft and slightly sticky. While dough rises, grease a 9×13-inch pan with butter. Set aside. In a medium bowl toss together raspberries, sugar, lemon zest, and cornstarch. Crush the raspberries just slightly as you stir. Set aside. In a medium saucepan, melt butter until it is browned and fragrant. Set aside to cool slightly. When the dough has doubled in size, turn out onto a floured work surface and gently knead for 1 minute. Use a rolling pin to roll the dough into a roughly 10×20-inch rectangle. Spread the butter over the dough. Spread the filling over the dough. Raspberries will be scattered across the dough. Working quickly, tightly roll up the dough into a 20-inch long log. Cut the log into quarters, then cut each quarter into 3 pieces. (This part will make a huge mess; my kitchen counter looked like a crime scene. A DELICIOUS crime scene.) Carefully and quickly lift the rolls into the prepared pan. The rolls will release juice into the bottom if the pan. That’s fine! Cover pan with plastic wrap and a kitchen towel and let rest in a warm place for 1 hour, until puffed. Preheat oven to 400 degrees F. Bake rolls for 20 to 25 minutes, until golden and bubbling. Remove from oven and allow to cool for 30 minutes. In a small bowl, whisk together powdered sugar, lemon juice, and limoncello. Drizzle glaze over cooled rolls and serve. Rolls are best served the day they are made but will last up to 3 days well wrapped at room temperature. This entry was posted in Recipes and tagged breakfast, Food & Farmers, meals, recipes by Propane Kitchen. Bookmark the permalink.